Why Would You Want a Dog Hair Blower? Yesterday at the dog park, Joanne brought pictures of Pierre, in addition to Pierre himself. I’m forced to think, as I suggested in 3 Best Boxer Dog toys, that I may have misjudged Joanne. She’s not the sharpest tool in the shed, but she’s not as snooty as I first thought, she really does seem to be trying to fit in, and I’m kind of starting to like her despite the fact that I don’t usually much care for rich women, or their little bat-eared dogs. These were “before, during and after” pictures. It seems Pierre had decided (horrors!) that it would be fun to play in a mud puddle, and I have to tell you, he was a total mess. His little bat ears were all scraggly and droopy, and he was so wet that he looked as if he’d lost about half his body mass (which isn’t all that much to begin with). Then, we saw pics of Pierre having his bath, and finally, the aftermath – pretty Pierre, all dried off and fluffy again. I asked Joanne what groomer she was using, and she said “Oh, I don’t take Pierre to a groomer – I look after him myself.” Well, I’m thinking, score points for Joanne! Then I’m thinking (but not saying), “Joanne, you have more frigging money than President Trump! Your shoes probably cost more than my car!” I just smiled (okay, okay, I grimaced) and told her that since Janice and Leroy were short-haired, I didn’t really have the need for a blower, but I figured they might be pretty useful for fluffy little guys like Pierre. Like I said, not the sharpest tool in the shed. Anyway, I’m not a cruel or malicious person, so rather than leave Joanne to her own devices with a tool as powerful and dangerous as Google, I told her that I’d do a bit of research and get back to her with some information about the best dog hair blowers. Like I don’t have enough to do. Sigh. Before I get to my actual picks for the best dog hair blowers, though, let’s talk a bit about these useful devices in general. If your dog gets into a lot of messy stuff, and has a long to medium coat, then it’s a safe bet that he needs regular baths. You could do what Joanne did when it comes to drying your dog off and just go through a lot of towels, but it’s really best to use a dog hair blower. One reason is that your dog’s skin is sensitive, and if you have to bathe him a lot, you could make him uncomfortable with vigorous rubbing using towels. The alternative would be to let him shake off the water post-bath, which is one thing if you’re bathing him outdoors but quite another if you’re doing it in the house. The other thing to consider is that if you love the feeling of clean, soft fur, you’ll get better results with one of the best dog hair blowers than you will with even the fluffiest towels. In fact, with a good blower, you’ll get results every bit as outstanding as if you took your dog to the groomer – because you’ll be using the same type of equipment. After you bathe your dog, you do have to dry him in one way or another. Air drying never works, because almost any dog is going to shake vigorously. Towel-drying is the next best solution, but you’ll never get the hair fully dry, and that means that there’s an increased risk of matting. Using your own hair drying on your dog is not really an option, for a few reasons. First, the airflow is usually not strong enough to get into the undercoat of a fluffy dog like Pierre. Second, the temperature is designed for humans, and even the low setting might be too hot for your dog. Third, your dog’s body temperature is higher than yours, so using a human blow dryer can cause your dog to overheat, dry out his skin and even result in a painful rash. The best dog hair blowers are designed to dry using cool air, so your dog will be comfortable, but they’re powerful enough to dry quickly. This is because the airflow is stronger than it is with hair dryers for humans. The best dog hair blower will be strong enough to dry even the fluffiest dog in little time. Look for a blower that has a high CFM (cubic feet per minute) value. The higher the CFM, the more air is blasted, and the sooner you’ll have your dog dried off. The best dog hair blowers are also designed to operate quietly. Loud blowers can make even the calmest dog nervous, and you want to be sure that your dog is comfortable with the procedure. That said, even the best dog hair blower isn’t going to be completely quiet, but there are several that won’t send your best buddy rushing for cover. Now, as to expense, which seemed to be Joanne’s concern (this from the woman who provides her dog with a jewel-studded collar and leash! ), essentially, you get what you pay for. I wouldn’t say that any dog blowers are really cheap – you can get a dog hair blower for around $60, but the best dog hair blowers are going to be up in the hundreds of dollars. When you consider the cost of regular professional grooming though, it won’t take long for a quality blower to pay for itself. The best dog hair blowers will also come with a good warranty, just in case something should go wrong. The best dog hair blowers are also easy to clean. This is very important, because they can quickly get clogged up from dust, hair and other grime. Ideally, you should choose a blower that has removable, replaceable filters. There are three basic types of dog hair blowers, and the one you choose will depend largely on how you like to dry your dog. Cabinet dryers (also known as cage dryers) allow you to place your dog in a cage so that he’s kept confined while being dried. These are the best hair blowers for dogs that are nervous when being dried. Most of them have adjustable speeds and temperatures. The only trouble with cage dryers is that they are not as powerful as other types, so they’re best suited to dogs that have short or medium-length coats. Stand dryers (also called fluff dryers) let you dry your dog without needing to use your hands to operate the blower. This means that you can brush while you dry. As you could probably deduce from the name, stand dryers are fixed to a stand. Force dryers (otherwise known as blaster dryers) are very powerful. They do not usually come with heating elements. Instead, the operation of the motor works to warm up the air while the blower operates. This type of dryer blows out air at such a high speed, your dog will be dried off in mere minutes. Now that you know about the different types available, here are my top 5 picks for the best dog hair blowers. The Oster Hi-Velocity Adjustable Table and Cage Dryer is one of the best dog hair blowers in the $900-$1000 range. It is very quiet, and has three heat settings, including “air only.” It also has a safety switch that automatically turns the blower off if it begins to overheat. The Challengair 560 is a cage dryer in the $300-$500 range. It is designed to maintain the drying temperature at 107.5 degrees, so your dog won’t feel cold, but won’t overheat either. The airflow is strong, so it will dry your dog very quickly. It may be too strong for small dogs, though. This is a low-priced force style dryer (about $65) with two speed controls, both of which are quite powerful, so you can rely on the Go Pet Club Pet Grooming Hair Dryer to dry your dog off quickly. It also comes with nozzle attachments that allow you to get to hard-to-reach areas. It’s a bit loud, though, so it might not be the best dog hair blower for skittish dogs. The XPOWER 2-in-1 fits in the $100-$200 range, and is lightweight and compact, but still packs a lot of power. It’s quiet, and the flexible hose makes it easy to get into tight areas. It also works as a vacuum, so you can use it to clean up dog hair. The only thing I can find to criticize about this blower is that it’s almost too powerful, to the point where you can end up having dog hair blown all over the place – it’s one of the best dog hair blowers for outside use, though. The Metro Air Force Commander is so powerful that it can even blow hair off a shedding dog, so this is another blower that might be better used outdoors. It’s modestly priced, in the $100-$300 range, but very sturdy. It’s also portable. The Metro is often chosen by professional dog groomers who offer mobile service. It is a bit loud, though, so it’s not the best dog hair blower for dogs that are not accustomed to being groomed. Of course, there are countless other dog hair blowers, some good and some not so good. My research leads me to believe that these are five of the best dog hair blowers. 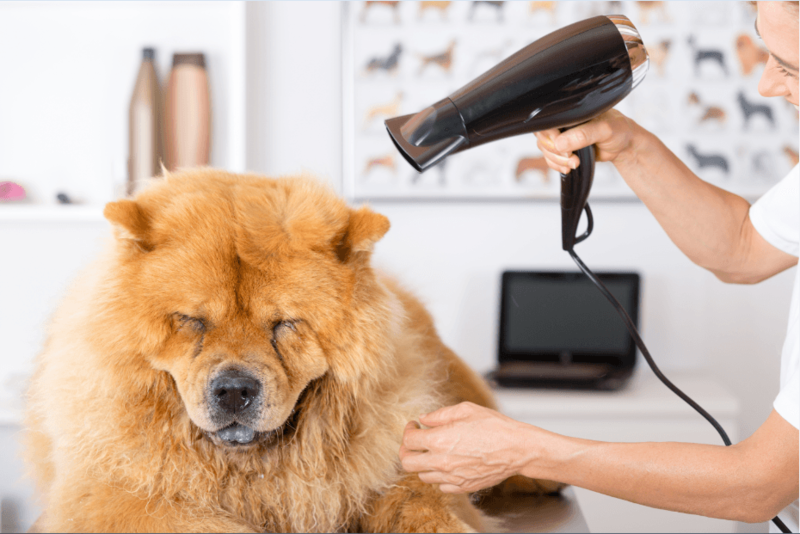 A good dog hair blower can certainly make grooming a lot easier – no shaking, no messy towels, no fuss and bother, and if you choose a quiet model, no stress for your dog. So, what did I recommend for Joanne and her little bat-eared buddy? The Oster Hi-Velocity Adjustable Table and Cage Dryer. Sure, it’s pricey, but it’s one of the best dog hair blowers, and it’s not like she can’t afford it. The remaining four are still pretty good choices for the rest of us! Should a Puppy 6 Weeks Old Ever Be Taken from Its Mother?